KCI is a professional art conservation firm that specializes in the conservation of sculpture and objects. We maintain a spacious, secure and beautifully equipped conservation facility in Minneapolis, MN. KCI has two principal conservators, Kristin Cheronis and Laura Kubick and as a team we have a combined 38 years of experience in object and sculpture conservation. Our work includes carrying out design phase assessments, conservation condition assessments, collections surveys, cultural resource documentation, hands-on treatment work, restoration, and historic remediation projects for public art, historic artifacts and sculpture in stone, masonry, concrete, metals, ceramic tile, terracotta, wood, plaster, terrazzo, linoleum, glass, bone, paper, plastics and resins, and botanical materials. KCI provides professional conservation services for all types of sculpture and objects, but we have become especially well known and respected for the conservation of modern and contemporary art, as well as outdoor sculpture and public art. The diverse repertoire of artworks treated by KCI include traditional sculptures, decorative arts objects, ancient artifacts, ethnographic objects, monuments, fountains, mosaics, multi-media art, kinetic art, and electronic media art. All of KCI’s work is carried out following the Secretary of the Interior’s Standards for the Treatment of Historic Properties and the Code of Ethics and Standards of Practice of the American Institute for Conservation of Historic and Artistic Works. 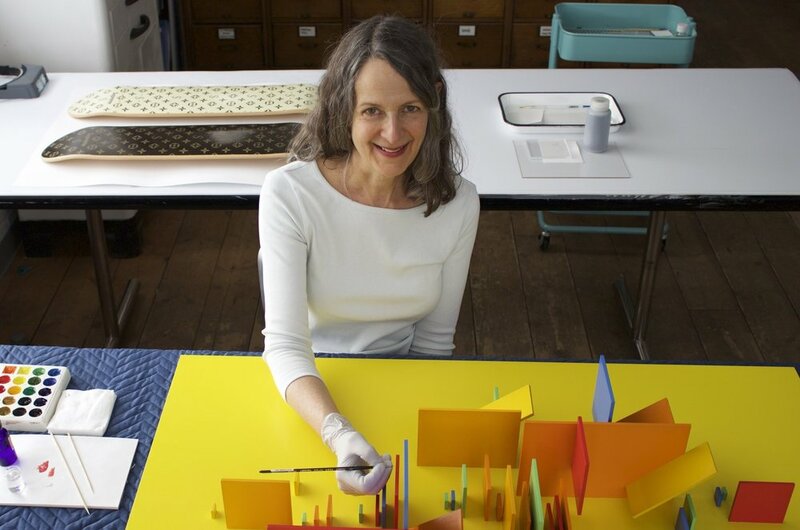 Kristin Cheronis has been a practicing Object and Sculpture conservator since 1986. She has been a Professional Associate of the American Institute for Conservation of Historic and Artistic Works since 1989. She works on a wide variety of projects including contemporary fine art sculptures, decorative arts, and historic artifacts from museums and private collections. Kristin has special expertise in the assessment and treatment of public art, including pre-fabrication reviews, on-site installation oversight, preparation of maintenance plans and onsite treatments of collections of public art. In 2001, Kristin founded KCI Conservation, a busy private practice with a focus in modern and contemporary sculpture, and public art. Prior to opening KCI, Kristin worked for 15 years as the Senior Objects and Sculpture Conservator for the regional conservation center at the Minneapolis Institute of Arts (MACC). Laura Kubick is an Object and Sculpture Conservator and a Professional Associate of the American Institute for the Conservation of Historic and Artistic Works (AIC). She frequently works with a wide range of objects and materials, including fine art, historic objects, public art, and outdoor sculpture, however she has developed particular expertise in the conservation of contemporary art and the conservation of painted outdoor sculpture. Before joining KCI Conservation, Laura was the Assistant Conservator of Objects and Variable Art at the Indianapolis Museum of Art and a Post-Graduate Conservation Fellow at the Smithsonian American Art Museum's Lunder Conservation Center. She holds a Master of Science degree from the Winterthur/University of Delaware Program in Art Conservation. Kubick received further art conservation training at the National Gallery of Art, the Shangri-La Center for Islamic Arts and Cultures, and Midwest Art Conservation Center.